Mario Cristobal prefers his blur offense with extra beef. Oregon's first-year coach still wants the Ducks to overwhelm teams with speed and pace of play. But Cristobal also received his "football PhD" in the SEC, which means his offensive lines are going to pack a heavyweight punch. So can Oregon mesh the uptempo spread attack Chip Kelly made famous with Bunyan-esque size and strength at the line of scrimmage? "I think the key is to just go ahead and do it," said offensive coordinator Marcus Arroyo of blending the best of both styles. "That's really our deal, that's who we are. We're going to play fast, we're going to play physical, we're going to run the football, and everything is going to come off our play-action. "Our guys know we go fast. We don't over-complicate it. I think that's the key to tempo football is make it understandable." The average weight of Oregon's projected starting offensive line — left tackle Penei Sewell (6-6, 360 pounds), left guard Shane Lemieux (6-4, 317), center Jake Hanson (6-5, 297), right guard Dallas Warmack (6-2, 336) and right tackle Calvin Throckmorton (6-5, 318) — is 325.6 pounds. The average weight of the Ducks' starting offensive line in the 2010 BCS national championship game was 297.0 pounds, and the average weight of the starting unit in the 2014 College Football Playoff title game was 300.8 pounds. "I just like how there hasn't been any kind of straying away from the power there needs to be on the offensive line if you want to be able to play into January, those type of games," Hanson said. "I really like the philosophy of being able to go really fast but not doing that at the expense of any power." Sewell is one of five giants from the 2018 recruiting class, which Cristobal was able to salvage after Willie Taggart's untimely exit for Florida State. The other true freshmen trying to practice their way into the two-deep during fall camp were Dawson Jaramillo (6-5, 332), Justin Johnson (6-7, 382), Steven Jones (6-7, 375) and Chris Randazzo (6-6, 358). Devin Lewis, a freshman walk-on from New Orleans, is listed at 5-11, 375 pounds. "Nike is still trying to fit those guys," Cristobal quipped. "We'll find our way to get them in shape." By 2012, Kelly's final year at Oregon, programs from coast to coast were implementing their own no-huddle, uptempo offenses to mimic the Ducks. That season Nick Saban wondered aloud: "Is this what we want football to be?" Two years later, Saban hired Lane Kiffin to be his offensive coordinator, and the Crimson Tide blended his spread attack with the big bodies Cristobal had developed on the offensive line. 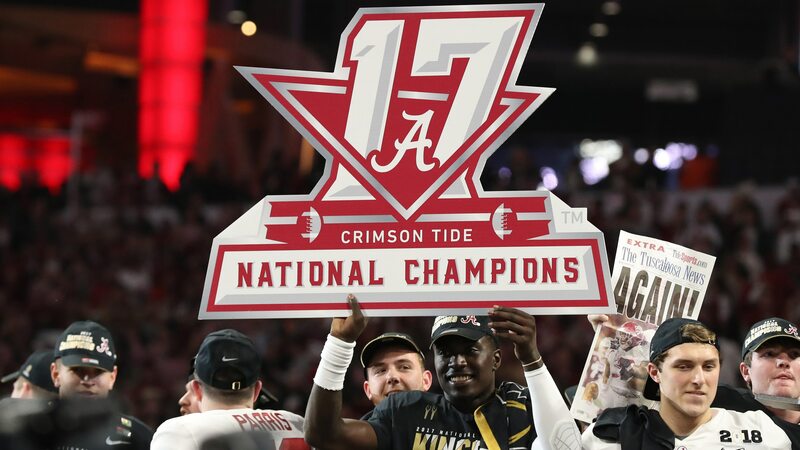 Alabama outlasted Clemson 45-40 to win the 2015 national championship. "It's something that we morphed to at the last place I was at," noted Cristobal, who was an assistant at Alabama under Saban from 2013-16 before arriving in Eugene as Taggart's offensive line coach. "We maintained the principles of playing power football at the line of scrimmage while becoming a tempo offense." In addition to having a stout offensive line entering his first season as Oregon's head coach, Cristobal believes the program is in great shape at tight end. Cam McCormick (6-5, 253) Jacob Breeland (6-5, 248), Ryan Bay (6-3, 240) and South Florida graduate transfer Kano Dillon (6-5, 256) should all get meaningful playing time with the Ducks planning to use formations with two and sometimes three tight ends. "Because of what we've seen in camp, I think it's worthy to note that these guys are going to be a big factor in our offense," Cristobal said. "They're good at the line of scrimmage, they're good off the ball and they're good outside, not only as blockers, but as receivers. "They've earned the right to be on the field." The program still has skill position players with track speed, headlined by senior running back Tony Brooks-James. Oh, and a potential Heisman Trophy candidate at quarterback who is 6-6, 240 pounds. "They've done a good job of getting used to what we do here and they've picked up what we needed them to do," Justin Herbert said of the gargantuan offensive linemen. "They're able to move the ball really fast." Herbert said when he was in the shotgun formation last year with Royce Freeman lining up either at his right or left hip, defenses started to figure out which side of the field the run was going to. Cristobal hired running backs coach Jim Mastro away from Washington State and allowed him to install the "Pistol" formation, in which the running back stand directly behind Herbert. "It is definitely an advantage because it gives me more time to read and let the blocks develop in front of me," Brooks-James said. "I have more time to read and react, instead of just hitting the hole full speed." Cristobal's philosophy is to run the ball between the tackles and set up the play-action passing game. Herbert will still have some run-pass options, but the star signal-caller has also been told to slide or get out of bounds avoid hits whenever possible. "He's watch you want there," Cristobal said. "I wouldn't trade him for anybody, and he's just scratching the surface. He's young, he's a puppy. But you've seen the numbers. When he's healthy, statistically it's hard to match us." Oregon athletic director Rob Mullens isn't worried about losing the offensive identity created by Kelly, mastered by Marcus Mariota and revamped by Taggart. The College Football Playoff selection committee chairman wants the Ducks to be prepared for any style of play in January. "Tempo, innovation, speed is always going to be a part of our program," Mullens said. "To be able to add power to it makes you more versatile. And as we saw, even when we were having this incredible success with our innovation, speed and tempo, we did have some issues when we played some teams that really dominated the line of scrimmage. "So hopefully this shift will allow us to, when we get in those situations, be versatile enough to be able to play either style effectively."